The exact words that came to mind when I saw this gorgeous stack was “OOOOOOKKKK,” as rapper Lil Jon would say. You get the drift. This thing is amazing and worthy of all the adjectives. This recipe is ridiculously simple and beckoning to be made. Just 1 pan, 4 ingredients, and 10 minutes until you hold this crispy, warm, sweet sandwich in your hands. Bonus? It’s vegan (utilizing my 4-Ingredient Vegan Nutella) and butter-free, relying on coconut oil for that crispy crust. When would one eat such a sandwich? I’m glad you asked! Anytime really, but more specifically I think this would make the perfect indulgent lunch, snack or dessert. I mean, who wouldn’t be impressed if you brought this out after dinner? Can we say, instant friends? If you try this sandwich, let us know what you think. Leave a comment, rate it, tell your mom, tell your wife, tell your kids – you get the idea. And don’t forget to tag a picture #minimalistbaker on Instagram so we can see. It’s literally the best. Cheers, friends! 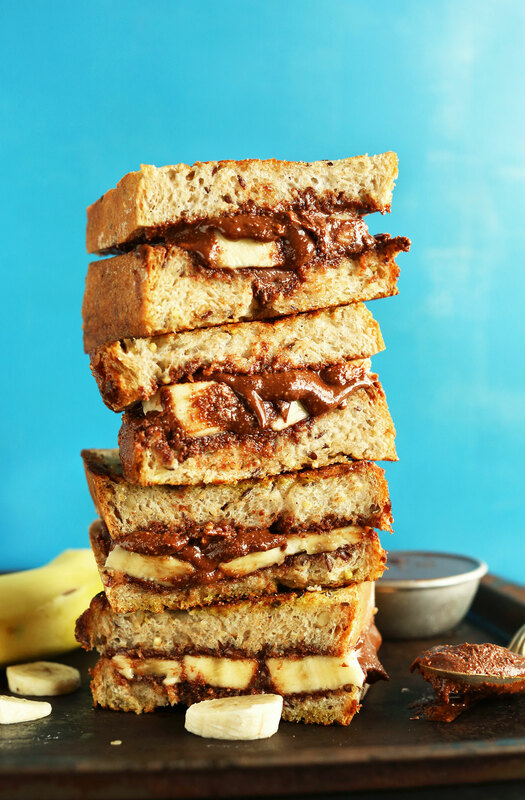 An AMAZING Grilled Nutella Banana Sandwich made with DIY Vegan Nutella, ripe banana and coconut-oil crusted bread! A delicious and incredibly satisfying snack or dessert. Heat a skillet (cast iron is best) over medium heat. 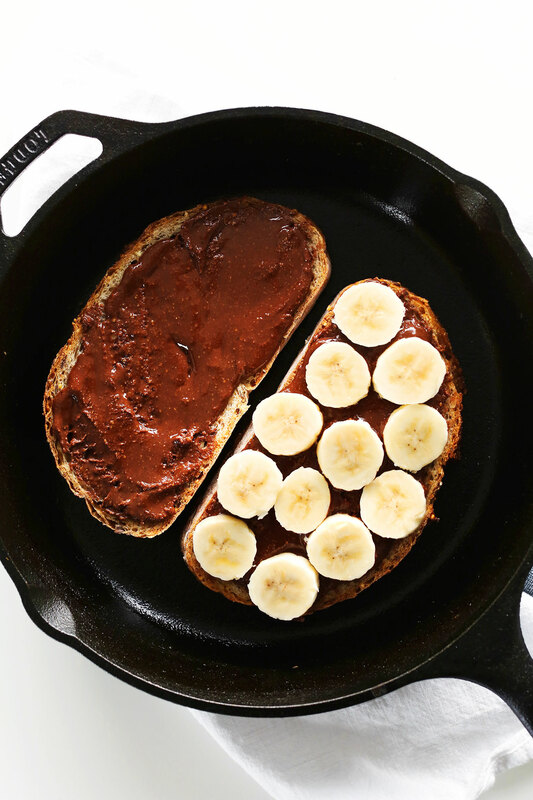 In the meantime, spread a generous amount of coconut oil on the outer-facing sides of your bread, then spread a generous amount of Nutella on both sides of the inner-facing slices (see photo). 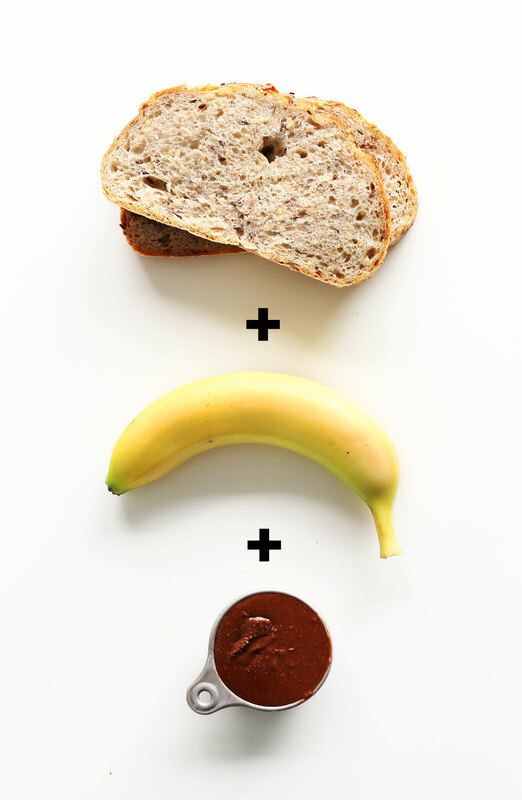 Arrange sliced banana on one side and fold together to make a sandwich. Once the skillet is hot, press the sandwich down and grill until golden brown and crispy - about 2-4 minutes. Lower heat if browning too quickly. Flip and repeat on the other side. Repeat until desired crispiness is achieved. Slice in half and serve immediately! This would be amazing with some homemade almond milk. Optional additions are listed above, though this sandwich is quite delicious on its own. *Nutrition information is a rough estimate for 1 sandwich using ~ 3 Tablespoons Nutella and 1 Tbsp coconut oil. Stats will vary depending on kind/thickness of bread. I tried it but instead of grilling I toasted the bread and put the sandwich together! Delightful and delicious ? Thumbs up for this recipe ? It’s a snowy day in NY wanted something sweet while my daughter and I are stuck indoors and this was perfect. Love the taste the coconut oil gave the bread. Yummm! Will definitely do it again. Part of my loves you, and at the same time, part of me loves you for this incredibly delicious, over the top sandwich!! 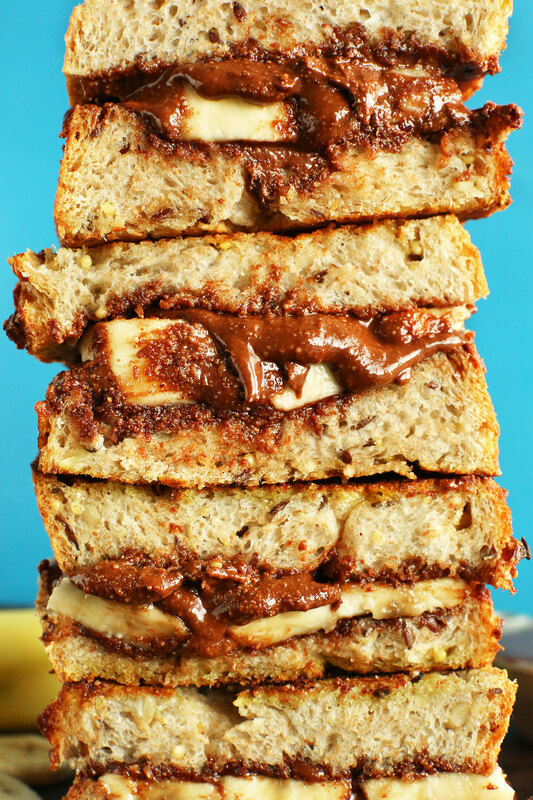 Literally everything I need in a sandwich – drooling! Thanks for such a great post. Very nice tommrrow morning IAm giving this to my son. Really loved this recipe. The coconut oil gives it such a delicious subtle smell and flavour. Very easy to make, too. I added strawberries to the inside of one of them and it was great. That picture is just too amazing for words!!!!! I just made this and it was delicious. Thanks for saving a late after work night dinner from being microwave food! I *need* to eat this RIGHT NOW. I’m off to buy some bananas haha! Seriously, it looks SO good!! It was really delicious, This is so cool..thanks so much for the info. Love it! I just had this for breakfast. It was absolutely delicious. I will definitely be making this again! Wonderful! So glad you enjoyed it, Anne! You had me at the Lil’ Jon references. This literally looks like heaven on a plate! Going to make this immediately. Like, now. Also, fantastic photography!!! My mouth literally fell open when I saw this! When I could finally close it I asked the hubbs to run to the store for all the ingredients! Dana, just stop, this recipe literally made my mouth water! 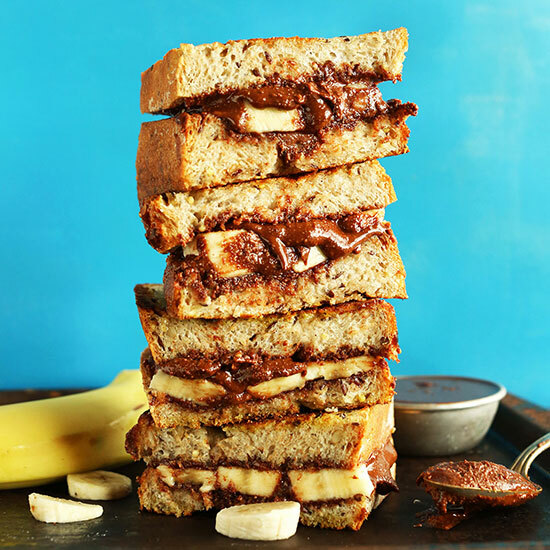 Banana and nutella is amazing, but putting it into a grilled sandwich is a stroke of genius! Do you know a good sprouted grain bread brand? I love it! Even with walnuts it more delicious! Well, hello beautiful!! I love little sandwiches like this because they are totally appropriate for every meal!! Who knew something so simple could look so delicious! 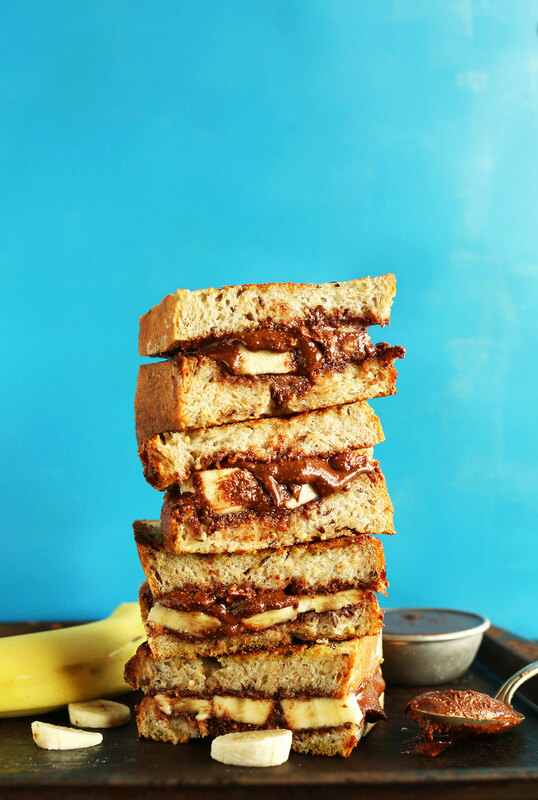 I mean that nutella melting out of the sandwich… kind of too much to take in right now. I will definitely remember this for my next nutella indulgence. Wowweeee! How can you not love this?! Also, uber-impressed with your epic stacking skills. Oh my gosh the Lil Jon reference seriously cracked me up!!!! 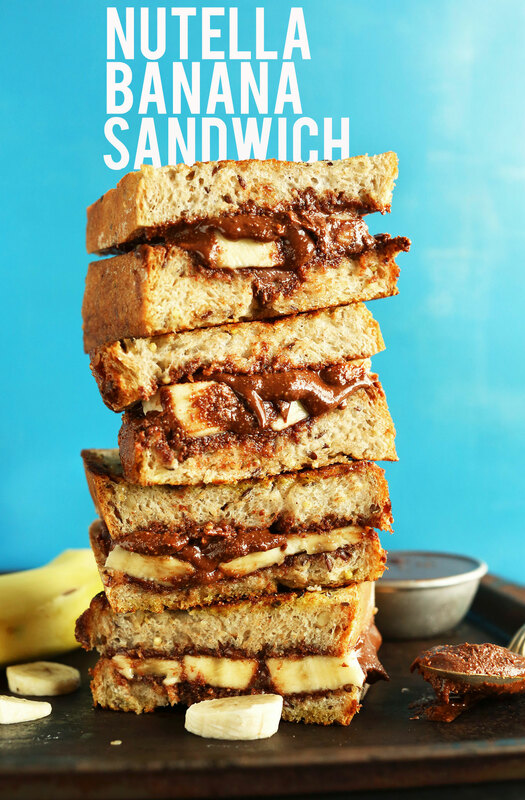 And the sandwich looks heavenly :) now I gotta whip up some Nutella and try not to eat it all before making at least one sandwich! Oh my god! You’re killing me. I have such a weakness for Nutella. I think I just found my new pre-workout bfast (on Gf bread for me) and my new hiking snack. I have no doubt it would still be delicious cold. OMG! This Sounds so good and simple ! I want to make it right now! I love your recipies and can’t wait to try this one! I think I just died and went straight to heaven! Planning this on a day where I get a lil extra movement in if ya know what I mean. Looks SO totally worth it though! !